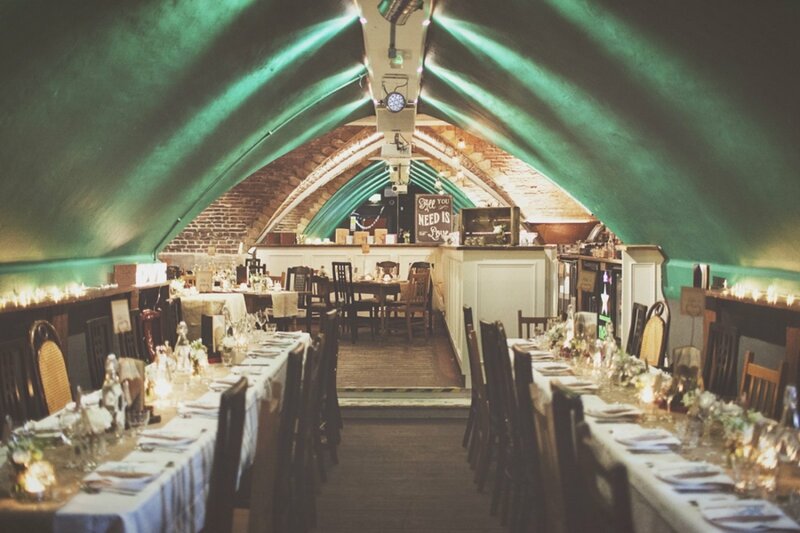 Lock 91 is an eclectic 19th-century lock-keeper’s cottage at the Deansgate Canal Lock, a quirky venue for your wedding reception that’s convenient for a ceremony at Manchester Town Hall. You can either book Lock 91 exclusively for your wedding party, or enjoy your celebrations in one of its unique spaces. The jewel in the crown of this much-loved cottage is the Attic and Cove – a cavernous yet elegant room consisting of a large dance floor, cove and bar, which make a luxurious and spectacular space for 50–80 guests. The Lounge and Terrace for 35–90 guests is on the lower ground floor and has a home-from-home comfortable and relaxed aura with its mix of seating, traditional fireplace and gilded-framed oil paintings. Double doors lead out from the lounge to the canal-side terrace with a retractable awning enabling year-round access. The team at Lock 91 works closely with Circle Events and Weddings, who will create bespoke menus for your special day.